What does a person say when her dream has been realized? I'm not big into crying, but I admit I've cried quite a bit in the last 22 hours since I heard. Random A.S. King Fact: I always tear up a bit during the Candice Bergen "Put Another Log on the Fire" skit on the Muppet Show and that's what I was watching when I got the call. My poor daughters are so sick of me saying, "Girls, there are still a lot of men out there who think like that. You need to remember this when you get older and start dating boys, okay?" Seriously. I say that every single time we watch that episode. The eye rolling on their part is getting more and more animated. That said, they both cheer when Candice shoots the door open and bares her awesome t-shirt. I will never be able to explain to them what the world was like in 1976, when that was filmed, but every time they ask, "Why does she shoot the door?" Anyway, I had just said that line to my daughters when the phone rang and I picked it up and someone introduced herself as part of the Michael L. Printz committee. Which, if you consider the content of Please Ignore Vera Dietz, is ironic timing. I'm not sure how to explain it to you, but I always considered VERA a book that can show readers what a good man looks like. I don't know how to back up that assertion but for a long time I was going to dedicate it to my daughters because I wrote it for them--so they could see what happens in real life and see how abusive people are made from shame and silence. I know Ken Dietz doesn't look like a good man to some readers, but in comparison to so many in the book, he is an amazing man. He can change. And that's a very hard thing for human beings to do. I think that's as far as I can go to explain why the Candice Bergen skit and Please Ignore Vera Dietz fit together in my head. They both illuminate the "norm" and both feature women who break out of it in their own ways. And I want my daughters to know that it's easy to fall in love with the wrong man. It happens all the time! What's difficult is breaking out of the relationship because when you discover you've landed under the control of another, shame and embarrassment can prevent you from getting out. Vera knew right from wrong. So does the character in the Candice Bergen skit. Consider this blog the sort of babbling one does upon getting news like this. I just don't know what to say, really. So I'll end here: A huge thank you to everyone who has ever supported me and to my good friends who understand that I am, like Vera Dietz, the kind of person who points to the elephant in the room and says, "Hey! look at that big honkin' elephant!" And a HUGE congratulations to all winners today--and a special shout out to Blythe Woolston, author of The Freak Observer who won the Morris Award! Woot! I was so happy to hear that I got tears in my eyes too! YAY!!! You deserve this award honor - as does VERA. It is an insanely good book, and I've been telling ya so all along. I've gotten to see a classic-to-be being published, and I am so proud of you. HUGE congratulations!!! And now I will read about Vera and think about my daughter and how I hope she's strong enough to make the right choices. Congratulations! VERA has been on my wishlist since I first heard of it. But after hearing that it got a Printz Honor...well I just had to buy it for my nook. Oh, WOW!! I told you in the Exton Mall that this book was going to win...didn't I?! Spectacular news and incredibly deserved. I AM SO HAPPY FOR YOU!!!!!! This book is amazing for so many reason and I'm thrilled to see it recognized in this way. Please Ignore Vera Dietz has made me make sense of things I didn't when I was a teenager. I know Vera and Charlie; I was Vera and Charlie. I wish I'd had this book in my hands when I was a teenager! I'm so glad you wrote it. I'm so glad I read it. 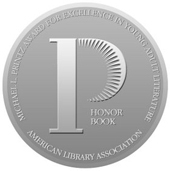 I'm so glad it's A FREAKIN' MICHAEL PRINTZ HONOR BOOK! congratulations - that's fantastic news! I can't wait to read everything you write! YAY!!!! I'm thrilled for you, Amy. I actually predicted recently (on my blog)that Vera would win the Printz award itself, but an honor is still wonderful (and in the bookstore, there's really no difference -- if it's got a sticker on it, that's what counts). Your post brought tears to MY eyes. Congrats! Vera and YOU are so deserving of such an honor. I have been reading the awards lists for the last twenty minutes or so, and about 60 seconds ago I read an e-mail from Random House congratulating their winners...I couldn't help but give a very loud "YES!!" when I saw Vera Dietz with this Honor. Wow. What a day. Thank you all so much for commenting here. I'm still at a bit of a loss for words, but I'm sure in a few days I'll be back to my normal self. You all made ME tear up! And isn't that Muppet Show Skit awesome? Wow, Writewong, thanks for the plug. Yes, that B&N buyer must be taking some heat today! Ha HA. Chester County Book & Music Company has SIGNED copies of PLEASE IGNORE VERA DIETZ! In stock! Woo hoo! We love Amy King!! Oh you guys just rock so much! I doubt anyone is taking any heat. :) But I do hope they might make an order. I get mail every few days "informing" me that the book isn't stocked at B&N. (Of course, I already know this.) It gets frustrating when you know so many people want to buy a thing that their store just isn't stocking. That said, it has given me the opportunity to get people to locate their indies and consider shopping there. So for me, that's a win. Joanne, thanks so much for your support! And Dr. Wong! YOU ROCK. Congrats Amy!!!!!! I'm so, so excited for you and Vera! Contest of Sap -- ALREADY CLOSED.